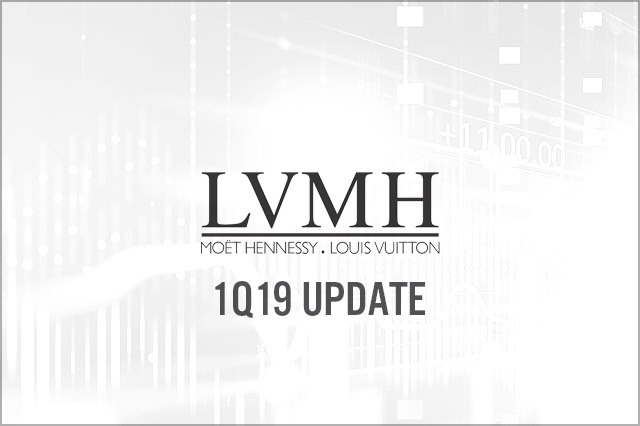 LVMH reported 1Q19 sales of €5 billion, with 11% year-over-year organic growth, or growth of 16% on a reported basis. Revenues at the company’s fashion and leather goods group rose 15% in constant-currency terms, or 20% on a reported basis, to €5.1 billion, setting the pace at LVMH. Louis Vuitton and Christian Dior had an exceptional 1Q19, according to management on the investor call, outperforming the fashion and leather goods group brand portfolio. Both the perfumes and cosmetics and wine and spirits groups achieved 9% constant-currency growth in 1Q19, followed by selective retailing at 8%, and watches and jewelry at 4%.